To adequately understand both the historical significance and the modern relevancy of Heritage Shorthorns it is important to review the foundation of the Shorthorn breed. Since there are several books (Reference Section) providing a detailed narrative on the Shorthorn breed only the most salient points of Shorthorn history are presented here. As with all cattle breeds the formation of the Shorthorn breed began with the desire to produce an improved animal with both the genotype and phenotype that would work in a specific farming situation or area often called a landrace. There are early records of Shorthorn type cattle dating back to the 1500’s in Britain. Most people believe Shorthorns were an amalgamation of local cattle in the Tees River Valley in England and cattle brought over from Northern Europe. 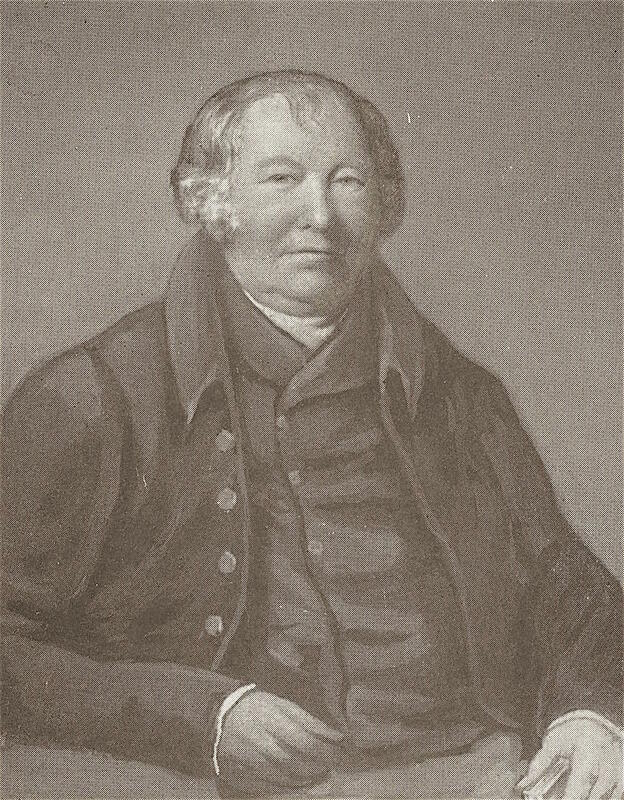 Robert Bakewell was an English sheep/longhorn cattle farmer, who today is considered to be the “Father of Animal Breeding”. He developed and employed what was a revolutionary breeding system called the “In and In” selective breeding method which was essentially intensive inbreeding. Examples of how “In and In Breeding” was utilized to both instill and stabilize certain traits in early Shorthorns can be seen in the pedigrees of several important foundation Shorthorn bulls. (Click link to see pedigrees.) Because this inbreeding program facilitated enhanced genetic character selection it came to the attention of many farmers during 1770-1800. Most people consider English brothers, Charles and Robert Colling, to be the founders of the Shorthorn breed. They had separate farms in the Tees Valley area and were prominent breeders of “Shorthorn type” cattle before they visited Bakewell to inquire about his new breeding/selection scheme. Through the application of Bakewell principles the Colling brothers significantly improved Shorthorns during the late 1700’s and early 1800’s. They stabilized and standardized many of the characteristics we see in Heritage Shorthorns today. The importance of what the Colling brothers accomplished can not be overstated, given that most Shorthorns in the USA and Great Britain derive from the Collings herds. Two other important English Shorthorn breeders played a substantial role in advancing the quality and promotion of the Shorthorn breed: Thomas Bates and the Booth family (Thomas Booth and his sons Richard and John). Thomas Bates emphasized milking ability in his herd and he developed the famous Duchess line which was based on a cow he purchased from Charles Colling. The Duchess line became so popular the frenzy for “Duchess genetics” became almost comparable to the the seventeenth century tulip mania in Holland. 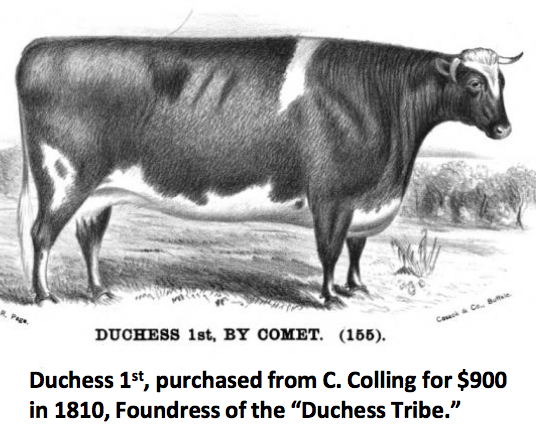 (The lineage and several pictures of the Duchess cows can found by clicking this link.) Most of the Milking Shorthorns today trace to Bates breeding. The Booths primarily tried to develop a “beefier” Shorthorn although they did not forget the milking aspect. Among the farmers of that period there was a saying “Bates for the pail and Booth for the butcher”. One other early Shorthorn breeder that should be mentioned is Amos Cruikshank. He was a Scotchman who lived near Aberdeen. He spent a lifetime developing his line of Shorthorns which became known as the Scottish type. They were a thicker, meatier Shorthorn that persists till today in Scotland. 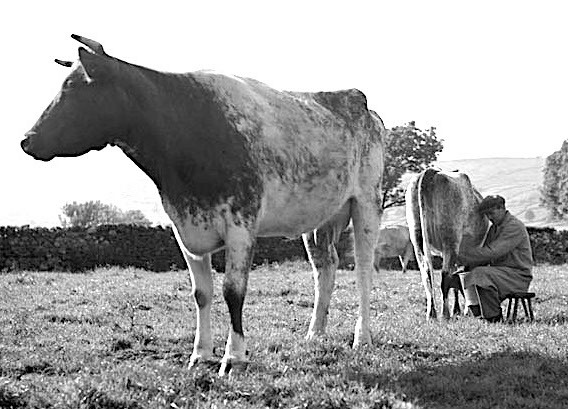 At one point, Cruikshank’s Sittyton Shorthorn herd was the largest in Great Britain. Many Scottish Shorthorns were imported into both Canada and America and were viewed as distinct from Bates and Booth type Shorthorns. Shorthorns were the first breed of cattle to have a herd book where pedigree information could be stored. 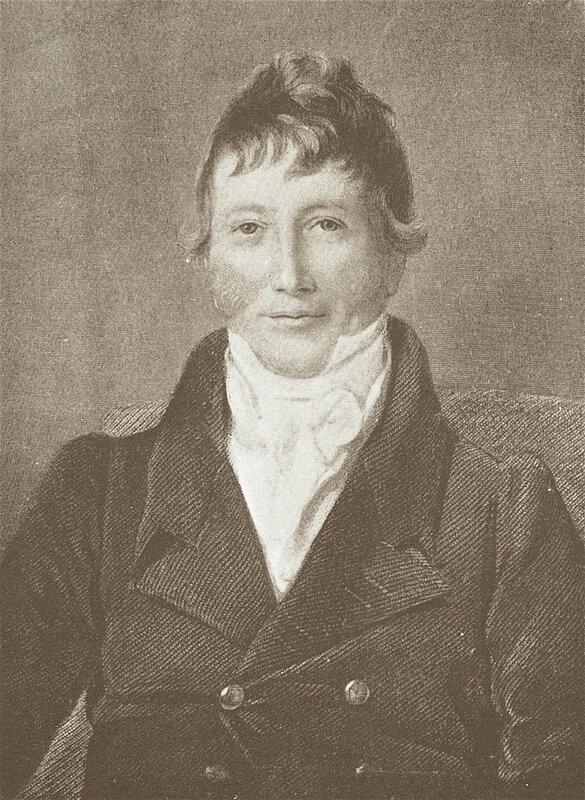 The task of compiling this first herd book fell to George Coates who judicially put all the known information together in what became know as the Coates Herd Book of 1822. In one sense this is the “bible” of Heritage Shorthorns because all Heritage Shorthorns today trace to this original herd book. Shorthorns were in America almost from the beginning of the country. Records show that the first Shorthorn type cattle came over in 1783 from England. These first Shorthorns were referred to as Durhams. Shorthorns were the embodiment of versatility because they could be used for milk, meat, and oxen. Their popularity with “settlers” was such that they assumed the role of the family cow and became embedded in everyday life in early America. From the early 1800’s Shorthorn importations were frequent. Some revolved around specific bloodlines, such as the Duchess line from Thomas Bates, while others were more the Scottish type (beef). There are several books that document all these importations if one is interested in the details, but suffice it to say, there was a massive movement of Shorthorns into this country all through the 1800’s and early 1900’s. This same thing was happening in many different countries and Shorthorns quickly became the most popular cattle breed in the world. Their dominance could be seen in Australia, New Zealand, South America, South Africa, Canada, and of course America. Shorthorn’s versatility was on display all over the world. For many years there was a brewing disagreement between essentially the beef and milking breeders of Shorthorns. There were several reasons for this but part of the problem was a disagreement about the utilization of fees for beef versus milking shorthorns. Ultimately this led to litigation and on July 28, 1949 a Court decree was issued whereby the American Shorthorn Association could register animals as Shorthorns and Polled Shorthorns—essentially the beef side of Shorthorns; while the American Milking Shorthorn Society was free to set up their own registration system which they decided was going to be primarily for Milking Shorthorns. Both ASA and AMSS have evolved from there but ASA is still mostly Beef Shorthorns and AMSS is still mostly Milking Shorthorns. Some Heritage Shorthorn breeders register their animals in both to further the dual purpose distinction. Starting in the 1950’s, promoted primarily by the beef show cattle industry, and lasting through the 60’s there was massive downsizing of Shorthorns in the USA with many Show cattle being only 2/3 of the original size. (This phenomenon also occurred in most other breeds of cattle in the USA.) It resulted in small, overly fat, slow growing Shorthorns that had calving problems and did not work well in a typical beef herd. Retrospectively it is hard to understand how this ever happened but it certainly demonstrates how Show Judges and Show Cattle can influence the cattle industry. Fortunately for the Shorthorn breed, Canadian and Australian Shorthorn breeders, along with a limited number of purebred Shorthorn breeders in the USA did not embrace this trend and preserved the genetics for medium size and larger Shorthorns. When the Shorthorn industry realized their blunder in downsizing, suddenly the prospect of using milking shorthorn type bulls, was seized on because of their size. No one utilized this business model more than Graham Land and Livestock Co. of Minnesota with bulls such as Columbus, Clark, Spiro, and Tea for the Tillerman. As often happens, there was an over correction so that Shorthorns, including Heritage Shorthorns, became very tall with a loss of muscle mass. This decreased muscling did not really start to be reconciled until approximately 2000. One would be remiss in not bringing up the influence of Heritage Australian genetics. Thanks to Rick Pisaturo, proprietor of Mandalong Stud in Australia, there was a very strong movement toward large, well muscled Shorthorns that took Australian Shorthorns by storm. This culminated in Mandalong Super Flag being imported into Canada by Dr. Gary Carter and eventually becoming the Supreme Champion Shorthorn bull at the 1974 Denver National Western Stock Show. Super Flag was the most influential Shorthorn bull that has ever existed in Canadian Shorthorns and secondarily he has also had a tremendous influence on USA Shorthorn genetics. Super Flag helped to right the Shorthorn genetic ship in both countries. Many Heritage Shorthorn breeders do not realize how Australian Heritage Shorthorn genetics can be utilized in producing Heritage Shorthorns that work in modern beef production systems. Unquestionably, the decision by both the American Milking Shorthorn Society (AMSS) and the American Shorthorn Association (ASA) to open up their herd books has had a profound effect on the Shorthorn breed. AMSS has had an “upgrade” program in place since 1945. ASA has allowed percentage Shorthorns since 1973. Both have taken steps to identify the “Shorthorns” that fall into these categories but the overall result has been a mixed message. Many Shorthorn breeders would say the benefit has been minimal at best. For AMSS the primary breed additions to Milking Shorthorns were the Australian Illawarra lines along with Red and White Holsteins while with ASA it has been Maine Anjou. Heritage Shorthorns distinguish themselves because they have never been a part of these programs and have maintained their genetic purity. The American Milking Shorthorn Society is to be commended for instigating their “Native Shorthorn” program in 1998. The decision by AMSS to start their “Native Shorthorn” program was undoubtedly the seminal event in the preservation of Heritage Shorthorns. It provided a procedure to document the legitimacy of specific Shorthorns as genetically pure. The continual discovery of older Shorthorn bulls that meet this “bar” provides evidence of the diverse genetic base that still exists within the pure Shorthorn bloodlines. It is important to note that the terms Heritage Shorthorns and Native Shorthorns are synonymous. The phrase Heritage Shorthorns is preferred because it is less confusing, and it can be linked to the Heritage Livestock Movement. All Heritage/Native Shorthorns are registered with the American Milking Shorthorn Society with an "N" classification.